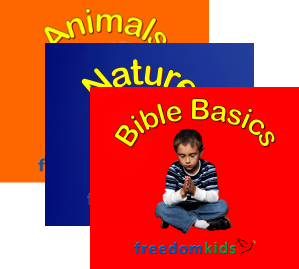 Freedom Kids™ is a Bible-based training program designed to teach young children God’s Word. Through Videos, Books and Music, this effective program gives parents, churches, schools and missions an amazing tool to disciple children in learning and obeying the Scripture. By employing the Freedom Kids™ program, children will learn a wide range of words from the Bible with corresponding Scripture. Infants, toddlers, and young children have incredible capacity to learn, and are constantly taking in the world around them. To help support and encourage this growth in a positive and godly way, Freedom Kids™ provides materials to help foster the learning of God’s Word. In every video & book, each word is written in clear, large print, so that the visual pathway of a young child can learn to recognize and eventually read the sight word. Further, through seeing, hearing and singing Scriptures repeatedly, young children will come to memorize these verses as God's Word is planted in their hearts. Parents and teachers will find it both refreshing and rewarding as little ones respond to the Word of God! "Using this creative and simple Bible program, my child was reciting over 20 Scriptures at the age of three!" Each Freedom Kids™ Bible video will introduce a child to 15+ Bible sight words with a corresponding Scripture. The videos help children to visually see the written Bible word, view the action or illustration of that word, and hear and see the corresponding Scripture. Made to compliment the videos, Freedom Kids™ books include 20 Biblical sight words with corresponding Scripture. The books will assist and encourage parents and teachers to interact with a child while centering everything on Christ and His Word. Freedom Kids™ music is joyful, original and filled with God's Word! Many songs are written and composed around Scripture giving children an effective way of memorizing verses while worshiping through song.